An update to Flash 10.2 is available in the market and it looks to be a big Honeycomb enhancer. Hardware accelerated video and enhanced browser integration are the stars, making the overall experience on your new XOOM or Transformer much more enjoyable (we hope). 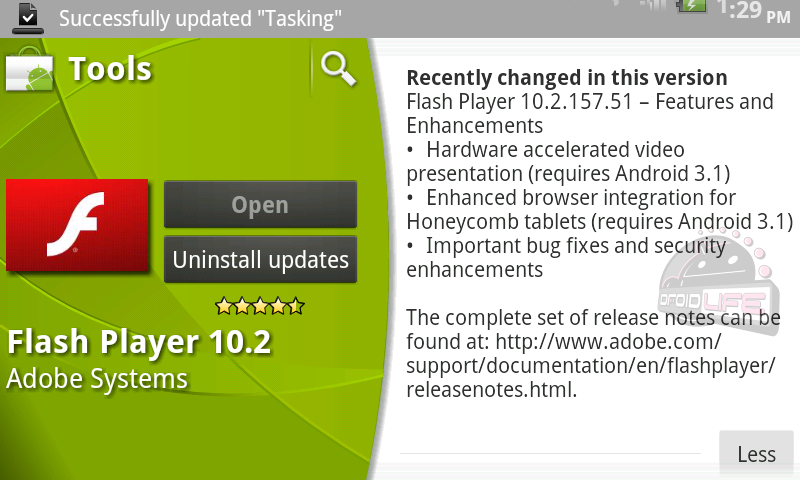 Update: As I clearly overlooked, this Flash update talks of Android 3.1 which is not out yet. The Honeycomb currently running on the XOOM is just 3.0.1, meaning things just got a lot more interesting, didn’t they? Was that new XOOM update from Verizon supposed to be 3.1? Is @GoogleNexus about to announce 3.1? I’m so confused. Update 2: The market listing has changed and just says “Android 3” now. Whoops! Update 3: The “3.1” reference was more than likely a big boo-boo and shouldn’t have been in there, yet. Adobe just let us know that this Flash 10.2 update will include all of the features listed there, but none of you will be able to utilize them until a new Honeycomb update is released which we’re now assuming will be 3.1. This could have been the update that Verizon told us was coming, but it doesn’t mention anything about new hardware acceleration or Flash support. So confusing. 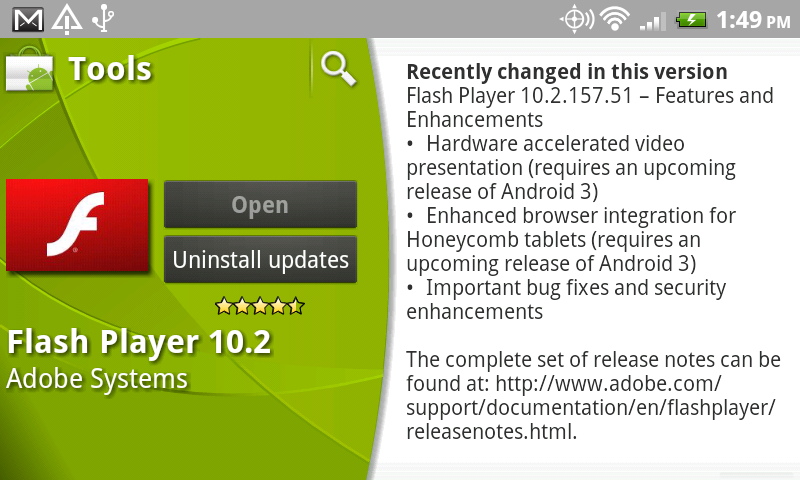 Today we are releasing Flash Player 10.2 for Android Honeycomb devices, available for download from Android Market. This final release will take advantage of Google’s enhancements in an upcoming update to Honeycomb, including hardware accelerated playback of 720p high-definition video referenced in our earlier blog post. Users of Android 3.0.1 will not experience these improvements until their devices receive the update to Honeycomb. In addition, this Flash Player 10.2 release includes a security update addressing the Flash Player vulnerability announced on April 15th for all versions of Android.